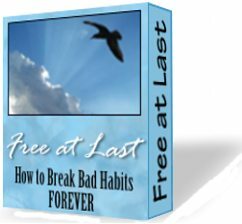 Free at Last: How to Break Bad Habits...Forever! This enlightening 35-page ebook can help anyone free themselves of their bad habits forever. The self-help/self-development field is huge and has been a hot market for decades in the print world. Now the digital world is cashing in on this monster market as well. The 35-page core product details how to design your own success plan for ending bad habits and discusses the six stages of change so readers can mark their progress. A 26-page ebook titled Confidence that is a great complement to the core product. Use this ebook as a free bonus to increase sales. The self-help market is huge. The print media has been cashing in on this market for over 100 years and it's bigger now than ever. That means this market is likely here to stay. That means if you buy this product, which includes master resale rights at no additional charge, you'll be able to sell it for years to come—most likely for as long as you choose. You might think a product about this topic and of this high quality would cost you a small fortune, but the cost is just $17.00! The minimum selling price (to protect your investment) is $17.00, so when you make just one sale you break even. Every sale after that is money in your pocket to spend as you wish! You could pay a lot more than that, as well. So how can I sell this package so cheaply? Easy, I didn't have hire that done because those are my strengths, I did it all myself. That works in your favor! In case you missed it before, you can view the sales page and sales copy here (link will open in a new tab or window). The core product—a 35-page, high-quality ebook that shows people how to overcome their bad habits for good. Master Resale Rights—you keep all the money from your sales, and it only takes one sale to break even and two sales to make a profit! As an incentive to your potential customers to buy, you get to pass on the Master Resale Rights to them to help you make more sales, and they can do the same, right on down the line. As an additional incentive for your customers to buy, a 26-page ebook about building self-confidence is included for you to offer as a free bonus. You get all this for just $17.00—make just one sale and you break even. Anyone can make one sale, but thing big—make 1,000 sales and you make $17,000.00! Even if it takes a few years to make 1,000 sales, that’s 17 grand you would never have otherwise. Getting rich rarely happens overnight, but if you start creating multiple income streams using opportunities like this, you're on your way. Get Free at Last Now! Yes—I want the Free at Last reseller kit right now! I understand this package comes with a 30-day money back guarantee if I'm not completely satisfied. Great! I also understand I'll get the Master Resale Rights, a professionally designed sales page with professionally written sales copy, the Confidence ebook, and more in my reseller kit—all at no additional cost! Free at Last and all the goodies is just $17.00 if you order today. Click the Buy Now button to get YOUR copy and get started today! PS - With everything you get, at this low of a price, is there really anything to think about?